New pattern with zip in the middle, inside and at the sides, fleece fabric and modern patterned fabric. This footmuff can adapt to fit all kinds of pushchairs on the market, and especially designed to adapt and co-ordinate to your pushchair. Complete with ties and Velcro attachment straps to make fitting easier on all designs and makes of pushchairs. 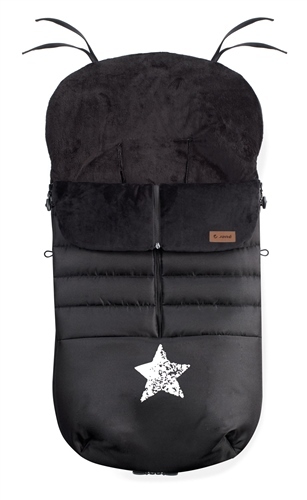 It has a fleecy interior and waterproof exterior that combine to protect your baby on the coldest of days. And for those hotter days the top cover can be zipped off completely to leave a soft fleece liner, while the cover can also be used as a pram quilt. This accessory can be used as a Pram Quilt, pushchair seat liner, and a footmuff. Universal design with different fitting options to the buggy seat (ties, Velcro straps or elastic enveloping corners) allows it to fit all pushchairs on the market. Especially available to adapt and co-ordinate with your pushchair. Anti-pilling fleecy interior, very soft and warm. Water resistant exterior to protect your baby on the coldest of days. Hard wearing and stain resistant. Top quality zip and materials. A very large, cosy, luxury footmuff / liner. The length of the footmuff can be shorted, so adjustable as child grows. Dimensions: 110 x 50cm approx. Conventional footmuffs with 'eyelet holes' (even ones that are classed as universal) allow for individual pushchair shoulder and waist harness straps to pull through individually inside the footmuff. However these types of footmuffs don't fit all pushchairs on the market. This is because new safety standards which are making pushchair harnesses were the harness shoulder and waist straps are continuously one strap. This means that if your pushchair has a 5-Point safety harness were the shoulder and waist straps are permanently joined together and therefore cannot be separated, then this footmuff is what you definitely require. This Nest universal footmuff doesn't use 'eyelet holes', instead they have been replaced with a back Velcro section were you can pull any 5 or 3 point harness through into the footmuff, making it truly universal.